The City of Madison Wisconsin Police Department will be hosting an event on October 3rd for the neighboring community. 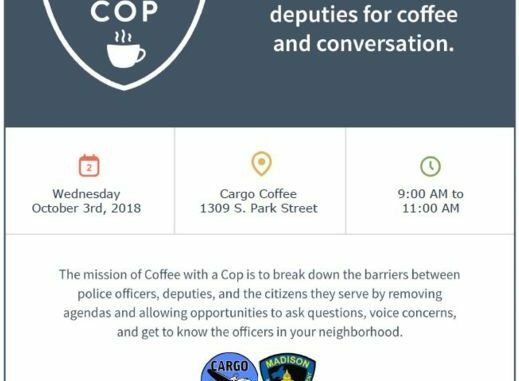 The event will be held at Cargo Coffee on 1309 S. Park St from 9a.m-11a.m. The event will focus on community relations with the officers and creating a bridge between the civilians and officers. Civilians are invited to come with prepared questions they may have not had a chance to ask the police department and concerns they may have concerning the safety and continued success of civilian officer relationships. National "Coffee with a Cop" day is right around the corner! (Hopefully Officer Page can learn how to spell OR proofread by then). Whether it's office supplies or coffee, you get what you pay for. Another very busy week in OP, from the Santa Fe Commons Park improvements, to Coffee with a Cop and a free weekend at the Overland Park Arboretum & Botanical Gardens.